Every three months we’re coming up with the latest numbers on the Magento Certified Solution Specialist certification. 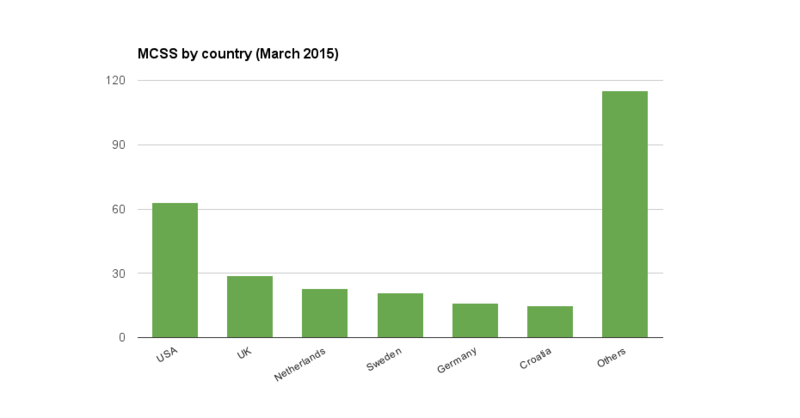 As we’re closing in to a full year since Magento rolled out its only business-oriented certification program, it’s good to check out some trends and see if the same countries and solution partners still hold the lead or have the tables turned. We bring you the third State of Magento Solution Specialist Certification report by Inchoo. The latest figures show that some trends have continued since my last report, with Europe further strengthening its global leadership (UK, Sweden and Netherlands helping the most with their growth ) and certificates popping up everywhere, with the likes of Mauritius being introduced to the list of countries where you can find a Magento Certified Solution Specialist. This time we can compare how number of certificates has grown over time – Europe has continued to almost double its total numbers between each of the reports, totaling at 158 and USA showing a bit stronger growth than in the previous period (50% compared to 35.5% from the last report). Worldwide, however, these certificates are growing at a much higher rate of 87% so USA is in danger of falling behind rather soon if these trends continue. But all of this fades compared to Asia’s huge 350% growth (it jumped from 4 MCSS in November 2014 to 18 in March 2015). 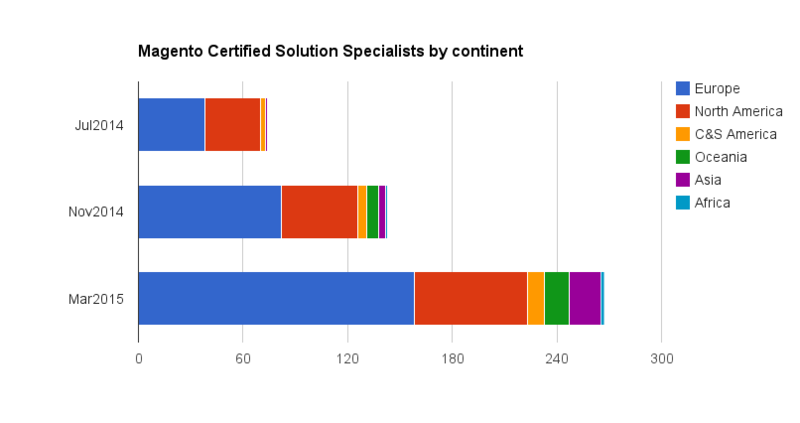 At the moment of drafting this report there have been 267 certified solution specialists out there (well, those that have been publicly listed to be more accurate) coming from the total of 39 countries. Top countries list hasn’t changed much, USA is still in a comfortable lead in front of a number of EU countries, however its global share has dropped further, to 23% (63 of 267) – as a quick reminder, in my first report in July 2014 USA held 43% of all the certificates worldwode (31 out of 74). As for the cities across the globe where you can find a fellow MCSS, our hometown of Osijek still tops the charts with 15 total certificates – but it’s getting crowded at the top as Stockholm is quickly closing in on us. Looks like those Vaimo guys really started taking these certifications seriously (plus they’re in slightly larger markets). A quick shout-out should also go to Rackspace as they (as Hosting partners of Magento) have 4 of their team members certified as solution specialists – this is a great proof of their commitment to Magento as a platform where most wouldn’t expect this extra effort. In my previous reports I made sure to mention all those fellow Magento community members who have made an effort to prove just how versatile they are by collecting all four available Magento certification badges (MCD, MCD+, MCFD and MCSS), and since the last report this list has more than doubled (from 7 to 18 people). Take a bow, gentlemen – you deserve it! Ever since we started preparing these reports, we haven’t seen any official data from Magento about solution specialist certification, so I’m actually very interested to see what numbers they will present at this year’s Imagine conference. Hi everyone, you may find the latest update to these figures interesting. Not sure about what are the official Magento procedures with the new partners onboarding, but I’m happy to see they’re looking a bit deeper into applicants rather than simply handing off partnerships to anyone who’d pay to be listed, they should be fairly certain that partners will (or are already) bringing value to the ecosystem and to merchants. Are you coming to Imagine this year? its incredibly hard to get any sort of reply from magento when trying to join their partner program. I haven’t seen any new members in the last 2 years(while I do not have access to the numbers) I have attempted to negotiate membership for 2 large hosting companies in the UK but magento seldom reply and when they have its normally just a stock response. After getting them on a phone call i was informed its more about who they pick to make partners now rather than anyone who applies or tries to approach them for membership. Interesting article and good to know they are still bringing on new members. Maybe you’re not getting any replies because your domain breaks Magento’s trademark policy. You can’t have the word “magento” within the domain name. Thanks for the great post and update in the Solution Specialist markt. One small thing, I miss two of my valued colleagues (Bas Rozema & Ashoka de Wit) how also made it to the “Cream of the crop”. So next to Martijn, Jitze en Rutger and all the others I would also like to take a bow to them! You can find the team and proof on 😉 : https://www.mediact.nl/het-team/.